You probably had it for breakfast this morning. Most mornings. 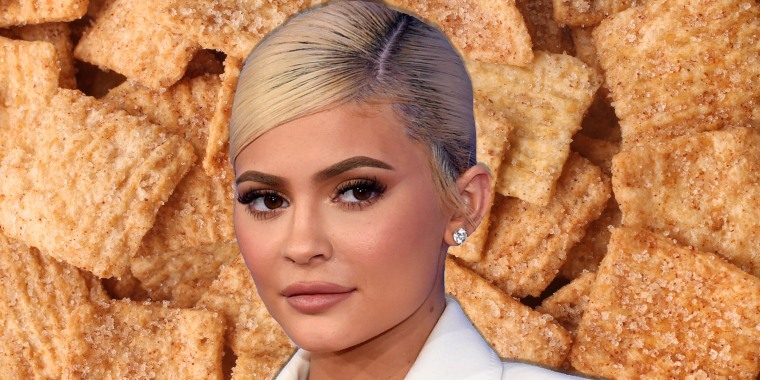 Before Monday, Kylie Jenner had never had cereal and milk for breakfast. Or lunch. Or dinner. She'd never had cereal and milk together, ever. Apparently money (almost a billion dollars of it!) does not buy you, well, "part of a complete breakfast!" Last night, the cosmetics and clothing line designer took to Twitter to announce her first time ... putting milk on cereal. "last night i had cereal with milk for the first time. life changing," she wrote. She tried Cinnamon Toast Crunch — cereal first — with regular milk poured on top. How ... is this ... even possible?! More than anything, we don't know how she went 21 years of life without having the after-milk of Cinnamon Toast Crunch. Life-changing, indeed. what do rich people eat for breakfast then? Jenner clarified that she had indeed eaten cereal before — just never with milk. "i always liked cereal dry i never bothered to put milk," she tweeted. Replying to a mom's tweet that her son ditches the milk for his cereal too, Jenner wrote that even after trying one of the most iconic food pairings in the world, she's still team no-milk. "I really prefer it too. But milk was cool once i gave it a chance," she explained. We can officially add Jenner to the list of celebrities who were probably too busy being famous and stuff to try some of the simplest snacks. Then, there was the time country music star and “The Voice” judge Blake Shelton had his first sushi experience in 2016 (only because Jimmy Fallon, who apparently loves being the one to introduce foods to celebs, forced it upon him) — and wasn't impressed. And who could forget New England Patriots quarterback Tom Brady trying a strawberry for the first time at 40 years old? As for Kylie ... who knows? Maybe she'll throw us for another loop soon and say she's never tried a chocolate-chip cookie before. Honestly, we wouldn't be surprised if she said she'd never dipped one into a glass of milk before.